Pictured here is the peanut ball and birth ball being used in Einstein's successful Reducing Primary Cesareans Project. The number of C-sections, which used to be the last resort in delivering babies, has doubled since 2000 according to TIME. In an effort to help turn that trend around, Einstein Medical Center Philadelphia earlier this year was the first local institution to join the American College of Nurse-Midwives (ACNM) Reducing Primary Cesareans Project. Einstein, along with 21 other hospitals nationwide, is working with ACNM to improve healthy outcomes for mothers and families by reducing the need for a cesarean section (C-section) among low-risk women who have never given birth. Since joining the effort in January 2018, Einstein Philadelphia’s C-section rate has decreased by approximately five percent from the previous year which translates into preventing about 79 C-section deliveries. How did the hospital achieve that result? By asking women in labor to do movements using oddly shaped exercise balls. “I’m a firm believer in having women move as much as possible during labor since movement decreases labor time and pain, and I’m proud that Einstein is taking a leadership role in implementing this approach,” says David Jaspan, DO, Chair of Obstetrics & Gynecology at Einstein Healthcare Network. It has been proven that the use of these balls helps loosen the ligaments and open the pelvic area, allowing the baby to more easily descend into the birth canal. This method also supports the lower back, helps reduce pain and can shorten labor and reduce stress and anxiety. Plus, laboring upright optimizes the position of the pelvis for the baby to navigate the birth canal with the help of gravity. 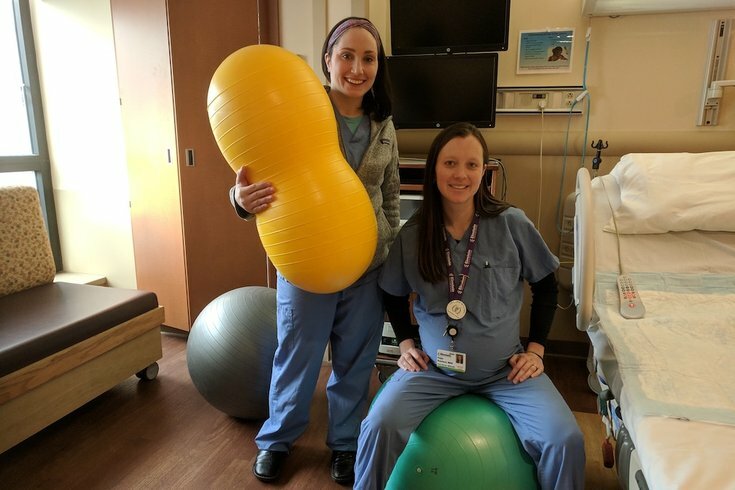 For women who need to be in bed during labor because they received an epidural or for other medical reasons, the peanut ball is utilized — which is essentially two birth balls fused together to look like a peanut. The peanut ball, which can be used in different positions, helps keep the pelvis open to keep labor progressing. Women who have an epidural benefit from a peanut ball and it can help to shorten their labor, studies show. Einstein Medical Center Montgomery is also part of this effort.